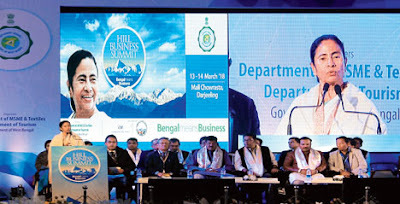 Darjeeling (WB), Mar 13 The Confederation of Indian Industry (CII) today said it will set up a multi-skill centre in Darjeeling in partnership with the Gorkha Territorial Administration. CII Director General Chandrajit Banerjee said this at the inaugural session of the two-day Darjeeling Business Summit. "This multi-skill centre will initially deliver training in hospitality, beauty and wellness and healthcare," Banerjee said. Since the region has huge potential in agriculture, floriculture and horticulture, CII's Food and Agriculture Centre of Excellence can also work with the administration in proposing a sustainable model, he said. "This would include better market linkages, increased productivity and quality and better variety of the produce. All this leads up to a more value added food chain, including processing," said the CII Director General. He said since many parts of Darjeeling continue to face water scarcity following increasing demand-supply gaps, the CII will apply its water scanning tool for developing catchment area plans. "The water scanning tool leads to identification of promising sites for rainwater harvesting and storages (micro and medium), irrigated agriculture, and control of Silt and contaminant transport into water bodies," he said. The inaugural session was attended, among others, by West Bengal Chief Minister Mamata Banerjee. The Confederation of Indian Industry (CII) today said it will set up a multi-skill centre in Darjeeling in partnership with the Gorkha Territorial Administration.